Fight the urge to smoke! For most smokers, the urge to smoke can be powerful. 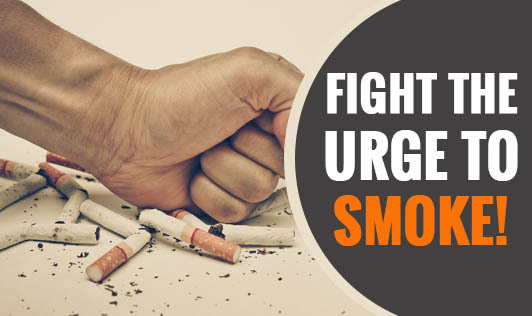 When an urge to smoke starts, keep in mind that although it may be intense, it will be short lived and will pass within a few minutes whether or not you smoke. • Identify trigger situations and have a plan in place to avoid them completely or get though them without using tobacco. • Delay the urge. If you feel like you're going to give in to your craving, tell yourself that you must wait for 10 more minutes and then do something to distract yourself for that period of time. • Exercise or any physical activity for about 30 minutes can make a tobacco craving go away. If you're stuck in office, walk up and down a set of stairs for about ten minutes. • Practice relaxation techniques such as deep breathing exercises, yoga and guided imagery. • Review your list of reasons to quit smoking, your reasons to quit are just as true now as they were when you decided to quit. • Join an online support group, learn from how others have handled their tobacco cravings. Remember that each time you resist the urge to smoke; you're one step closer to quitting it!